Video: Why Hal Herzog wrote "Some We Love..." . Article: The Atlantic: Are Rabbits Pets or Meat? Article: L.A. Times: Love cats, eat cows? 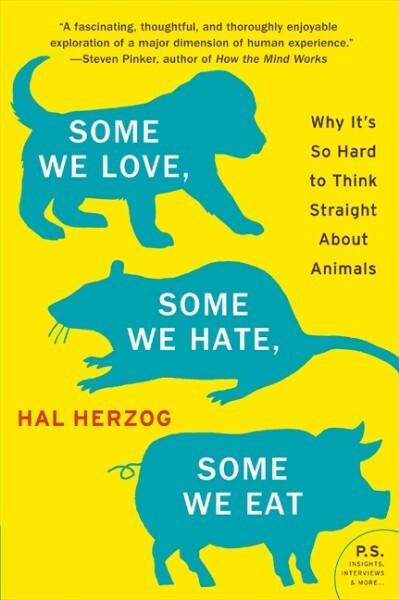 Hal Herzog, author of Some We Love, Some We Hate, Some We Eat: Why It's So Hard To Think Straight About Animals (Harper), is an internationally recognized researcher in the new science of human-animal relationships. The author of over 100 scientific articles, his research has been widely covered in the media including Time magazine, Newsweek, Salon, USA Today, Slate, and National Public Radio, as well as many national and international newspapers and magazines. He regularly writes on animal issues for newspapers including the New York Times and the Washington Post. An award winning teacher, Herzog is a sought-after keynote speaker at conferences and universities across the country. Herzog takes audiences on a highly entertaining and illuminating journey through the full spectrum of human-animal relations, relating his own groundbreaking research on animal rights activists, cockfighters, professional dog show handlers, veterinary students, biomedical researchers, and circus animal trainers. Through psychology, history, biology, sociology, cross-cultural analysis, current animal rights debates, and the morality and ethics surrounding the use and abuse of animals, Herzog carefully crafts a seamless narrative composed of real-life anecdotes, academic and scientific research, cross-cultural examples, and his own sense of moral confusion. How do we reconcile our love for cats and dogs (and rabbits, snakes, hamsters, gerbils, and goldfish) with our appetite for hamburgers and chicken breast and our use of medications that have been tested on lab mice? Why do so many of us -- as meat eaters, recreational hunters and fishermen, and visitors of zoos and circuses -- take the moral high ground when it comes to condemning activities like cockfighting? And why are dogs considered pets in America but dinner in Korea? Herzog offers a lively and deeply intelligent look inside our complex and often paradoxical relationships with animals. Drawing on over two decades of research in the interdisciplinary field of anthrozoology, the science of human-animal relations, Herzog examines the moral and ethical decisions we all face when it comes to the furry and feathered creatures with whom we share this planet. Herzog is Professor of Psychology at Western Carolina University. He lives in the Great Smokey Mountains with his wife Mary Jean and their cat Tilley. "Hal Herzog spoke to a cross-section of faculty and students from across the university while visiting Yale. His presentations were both soul-searching and provocative, his manner open-minded and down-to-earth, yet always informed by the latest empirical research." "Our campus selected Some We Love, Some We Hate, Some We Eat for our shared reading assignment this past fall ...We were fortunate enough to have Dr. Herzog join us for a guest speaking engagement ... He was very accommodating in touching base with us before his visit to ask if we had any particular areas on which we would like him to focus; as we had recently selected the topic of ethical decision making as the theme for our academic year, Dr. Herzog tailored his talk to touch on that topic. His presentation, like his book, was thoroughly thought-provoking and accessible. Dr. Herzog presented the audience with a great deal of new information while building upon that found in Some We Love ..., allowing a base of familiarity to spark discussion without simply revisiting his work. He was especially adept at eliciting audience participation and challenged our campus community to think deeply about the complicated bond that we have with animals. Based on the level of engagement at the event itself coupled with feedback given afterward, I know that students, staff and faculty alike were pleased with Dr. Herzog's visit and found it to be a memorable and stimulating lecture. We are grateful that he took the time to field as many questions as our audience offered; he was equally gracious in agreeing to stay afterward to meet our students and sign copies of his book. I would highly recommend him as a guest speaker at any campus." 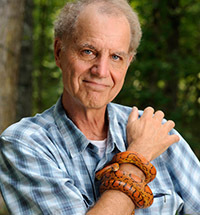 "One of the true sages in the field of human-animal relations, Hal Herzog has penned a book that is a carefully crafted blend of scientific data and Hal's own thoughtful and perceptive observations of people's beautiful, complex, and, at times, conflicted relations with nonhuman animals. Hal is an engaging orator who never fails to amuse, to inform, and to provide opportunities for serious reflection." "Some lectures our students love, some they hate, and some they love so much they talk about them days later. Hal Herzog's ideas about people and animals lingered and reappeared for weeks, in class and out." "At the recent University of North Dakota Writers Conference 'Humanimal' which I directed, audience feedback consistently named events at which Herzog spoke as among their favorites. I would recommend him highly as an author and speaker for events that address human-animal relations in a literary or interdisciplinary way." "Thank you so much for coming to Miami University to participate in our Altman Fellows program and for coming to visit with the students in my "Medicine, Disease, and Culture" class. I think it is an understatement to say that you achieved your goal, as described in your lecture, of confounding assumptions and challenging people to think. The students in AMS 180 had their minds blown away! They were very excited to have met you and to be thinking such deep thoughts about animals and humans. Several approached me afterward about what an engaging and eye-opening afternoon they had had and to ask what other Altman events they could go to! So, thank you so much." "A fascinating, thoughtful, and thoroughly enjoyable exploration of a major dimension of human experience." "Hal Herzog does for our relationships with animals what Michael Pollan in The Omnivore's Dilemma did for our relationship with food. This book is a joy to read, and no matter what your beliefs are now, it will change the way you think." "Reminiscent of Freakonomics ... An agreeable guide to popular venues of inquiry in the field of anthrozoology"
"A page turner that I daresay puts Herzog in the same class as Malcolm Gladwell." "A fun read ... What buoys this book is Herzog's voice. He's an assured, knowledgeable, and friendly guide." "An instant classic ... A smart and provocative book that is also a quick, enjoyable, and easy read, which is not easy task given the complexity of the book's question." "Read this book, read it again, and share it widely. It is that important." "Wonderful ... An engagingly written book that only seems to be about animals. Herzog's deepest questions are about men, women and children." "Everybody who is interested in the ethics of the relationships between humans and animals should read this book." "An intelligent and amusing book that invites us to think deeply about how we define - and where we limit - our empathy for animals." "Herzog writes about big ideas with a light touch ... Insightful, compassionate, and humorous."